A pantry solution that has shelves that rotate down to you and double your storage. Operates like a vertical carousel. The AutoPantry® is a motor-driven, electric, vertical carousel that brings shelves up, down and around so that they can be easily available for the user. It can be designed to be installed with the bottom shelf of the unit at eye level or as a larger floor to ceiling unit. Not only does it bring items down that are normally out of reach but it also brings items from the back of your pantry to the front for easy access. The AutoPantry® can be operated in both directions for either an up and down motion. Regular stationary shelves can be installed below to hold heavy or larger items. The AutoPantry® can also be installed for wheelchair access, allowing a person with limited reach to access pantry items. 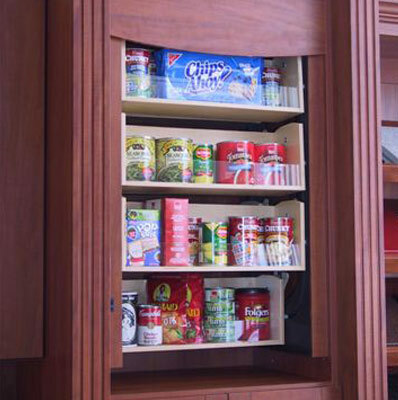 The AutoPantry® is available as a closet or cabinet “insert”. It comes fully assembled with natural Baltic birch shelves with semi-gloss clear polyurethane finish. The enclosure for the unit is painted black which is then slid into an existing cabinet or closet and requires just a few screws to hold the unit in place. Facing or trim must be added that matches the rest of the closet. The unit must be fully supported at the bottom using a strong shelf or platform. It can be installed in walk-in closets, reach-in closets or pantry style cabinets. Watch the AutoPantry® In Action! “The AutoPantry® is wonderful! I caught our cabinet guy looking at it as if he wanted to copy it and I shooed him away. It is an awesome device. I wish I had done two in the kitchen or one floor to ceiling totally”. Available in 18”, 24” and 29” deep cabinets. Widths range from 26 inches to 40 inches and height can range from 43 inches for the AutoPantry-18 to over 9 feet on all models. Shelves are made out of Baltic Birch and are clear coated in semi-gloss polyurethane. Shelves have a clear acrylic front guard to secure storage items which is see through for easy reading of labels. The AutoPantry™ is operated by pressing and holding the switch to move the shelves up and down. The momentary switch must be held constantly for shelves to move. The unit is designed for light-weight items such as small cans or small boxes. The load limit per shelf is 20 lbs. THE UNIT MUST BE IN BALANCE TO OPERATE. Do not have two or three shelves fully loaded that are all next to each other and all the other shelves empty. When loading the unit for the first time make sure the AutoPantry™ stays in balance . *Caution! ALL items included on a shelf must be NO taller than the back of the shelf. Failure to adhere to this warning could cause the unit to jam.